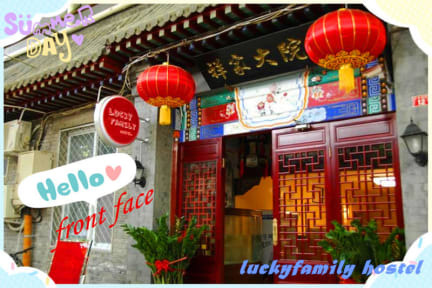 --Join our Lucky Family here in the heart of Beijing. This is a recently developed, traditional, Beijing hutong homestead. It is a hostel by name, but a home by nature. We are a family here and our guests are extended members. We endeavor to provide all who stay here with a relaxed environment, within close proximity to all major sites. For the more physically active, we are within walking distance of tiananmen, qianmen, guloudajie, houhai, sanitun, wanfujing, yonghegong and many other areas of interest, including of course,the famous hutongs themselves. For those who prefer to save their feet for the sites themselves, we are 3minutes from zhangzizhonglu subway station (line 5). This subway line offers easy access to all of the major sites in Beijing. We have 2 comfortable common rooms. The larger of the two has 2 computers for public use with internet access. This common room also has a selection of books, games and a large television. We have regular movie nights here. The smaller of the two also has a television and is used as our breakfast room. Your Interest is in Our Interest. It is located in the traditional hutong area. 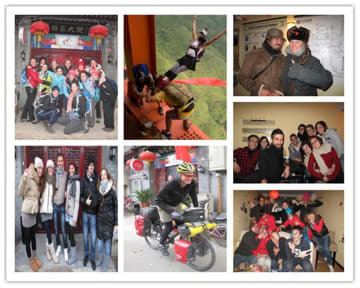 Staying with us will definitely give you an unique experience in living with a Chinese Big family. For the price you pay this hostel is perfect. Nice and friendly personal and good location. Beds are a little hard and showers can definitely be cleaner but I would really recommend this hostel for travelers looking for a cheap but decent hostel. Btw I enjoyed the Great wall tour I booked at the hostel a lot. Definitely would recommend to buy it here. Straight to the wall for a nice hike without any hassle of shopping or something else. To be honest, as a Dutch guy I went here because it was cheap and the location was good.Then you get just what you expect. The staff was nice... The only major drawback is the hygiene. I don't mind a place being rundown, but you can at least clean the bathroom more than every... let's say five years. Also it's imposible to go to the toilet and stay dry when somebody just had a shower. If hygiene means a lot to you and you don't want Fungi I wouldn't recommend it.